Augmented reality, teased for several years, finally breaks through at the Big Game. Two Super Bowls ago, Microsoft released a spot touting its HoloLens mixed reality goggles as "the future of football." It imagined stadiums appearing in living rooms or TV viewers transported, through their goggles, to the stadium. The tech wasn’t available yet, though, and augmented reality didn’t make any appearances during that game, or the next one. This future of layered experiences looked a little far off. 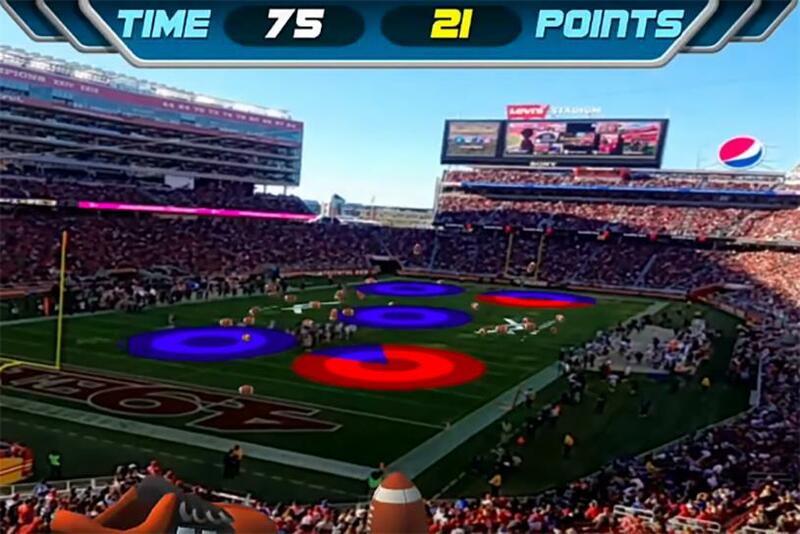 But much has changed in the last year, and this Super Bowl will see not just the debut of AR around the game but a deluge of it, often in the form of apps to keep users busy during commercial breaks and downtime. Users who bought game tickets on StubHub had the option to experience their seats ahead of time using an AR app. Ally, the online bank focused on high-interest savings accounts, is debuting a money booth-style AR game that only works during commercial breaks and encourages users to save their money instead of spending it on the products being advertised. Activations like these are exploding because they are only recently possible to execute. "Last Super Bowl, you could have pulled an experience off, but it would have been very unstable," said Lyron Bentovim, CEO of the Glimpse Group, a portfolio of AR and VR startups. "This year, especially since ARKit and ARCore came out, [we’ve] finally hit the the point where creating a ‘wow’ experience is very easy." That’s why small companies like Minneapolis brewery Finnegans are getting in on the tech. The beermaker donates all its profits to food charities, and thus can’t spend on Big Game advertising. Such cost-effectiveness was also one of the inspirations for Ally’s activation; with a product focused on money consciousness, "for us to go out and spend lavishly on a Super Bowl spot didn’t feel right," the company’s Chief Marketing Officer Andrea Brimmer told Campaign US. Ally isn’t the only player in the gaming game: Virtex Arena is a new app that gives users a few football-themed games to choose from for passing time during downtime. Fans can play at home against each other, and for those lucky enough to snag a stadium seat, the game happens on the field and adjust to fit a ticketholder’s seating position. These are all neat tricks, but not guaranteed to work, said Bentovim. "The challenge right now is to create experiences that create enough interest to cause the user to actually get their phone out." Because AR is still tied to an app, activation requires multiple steps that users really have to want to go through. And right now, too many brands are making the mistake of investing in short-lived AR activations. Instead, said Bentovim, brands should be "doing things that are sustainable and not one-off, things where there’s a use case where people derive value out of the experiences." One of the startups in his company’s portfolio is creating an experience for restaurants that allows patrons to see what dishes look like before ordering. Another is working on a tour guide app for deployment in cities. "Those are the activations that make sense, that are worth taking your phone out to activate, because it adds value," Bentovim added. With AR already invading the Super Bowl this year, it won’t be long before such activations are commonplace in brands’ campaigns around the game—particularly for local businesses like Finnegans. Bentovim pointed to the availability of user data as a potential for companies to effectively target new customers around a major event, like a local pizzeria offering special discounts for football fans. "Things that, as people watch the game, give them more information and really enhance the user experience of the Super Bowl," he said. Strategy lessons from football: anticipate or observe?